The client, a venture capitalist, art collector, world traveller and sportsman, approached us about a new powder room for the top story of his family residence on the north slope of Russian Hill, an exclusive neighborhood of colorful old buildings, some dating back to the 19th century. He ended up with the whole top floor completely reimagined as an adult retreat. While the existing upstairs sitting room was spacious and welcoming, with a panoramic view of Golden Gate Bridge, Ghirardelli Square and Alcatraz, the sole bathroom on the floor and an adjacent dressing room, situated in the center, were dark and claustrophobic. We proposed enclosing a small deck to create a bright 90 sq. ft. en-suite master bath, a new dressing area, and a powder room accessible from the hallway. The challenge was to make a room feel big without the benefit of a view. We saw this project as nestling a master bath in the trees, playing with the variegated light in the foliage and creating an indoor/outdoor shower experience. Blue sky and lush trees are visible from the shower through a large picture window, while light filtered by the greenery splashes over the counter through a long, low view window. 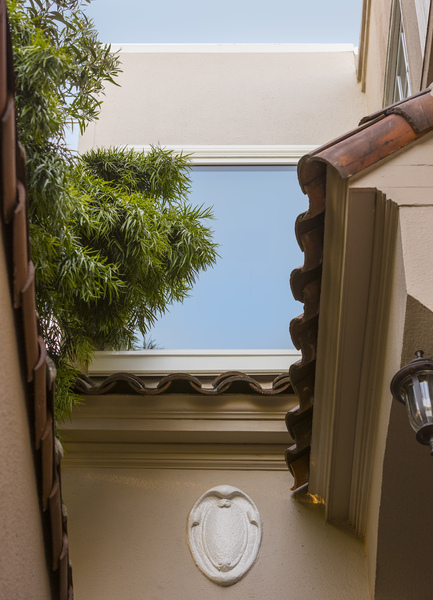 A new skylight straddles the master bath and the powder room. 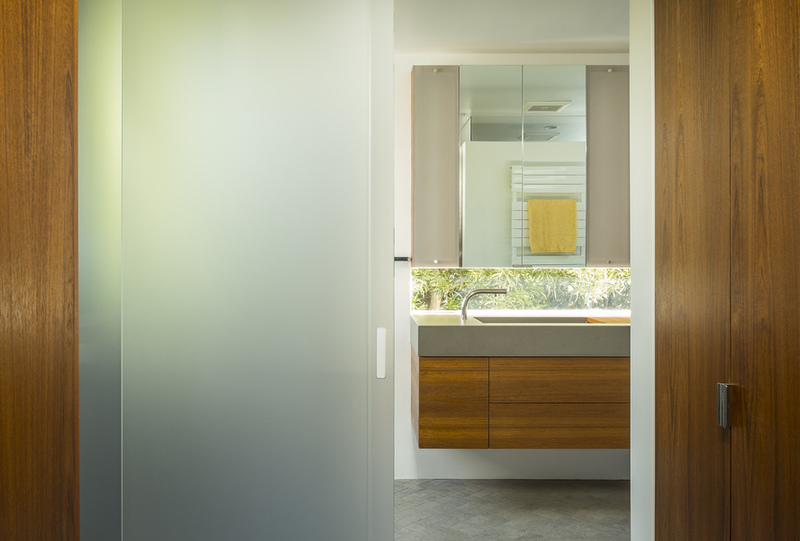 Transom glass around the perimeter of the powder room allows glimpses of light bouncing through both the bath and the powder room as well as the new dressing area. We used translucent glass, mirrors and windows to invite a deeper look into the space. To balance this complex layering of architectural elements, we opted for repeated geometric forms and an understated material palette. White walls form a quiet backdrop for the rich teak cabinetry and bold modern art. 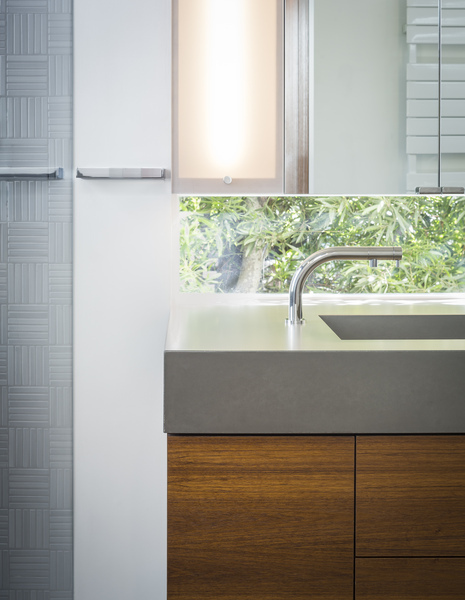 An 8-foot-long custom concrete countertop with integrated dual sinks anchors the space with its earth tone and sculptural feel. Handmade tiles add to the room’s warmth with their natural color variations and pleasant tactile quality. The floor is herringbone field limestone, and the shower surround is clad with Pratt & Larson parquet ceramic. Custom sliding glass doors with tracks that disappear into the ceiling and a handle carved directly into sandblasted glass allow the material to speak for itself. Pocket doors separate the master bedroom, master bath, and the dressing area, so that the couple can get ready discreetly in the morning. The powder room door opens into the hallway near the stairs. The homeowners now have a whole new experience of the top floor. Walking from the sitting room to the master bathroom, one transitions from an expansive bay view to an otherworldly nest hidden in the trees. And so it is that a daily activity is elevated to a one-of-a-kind experience.